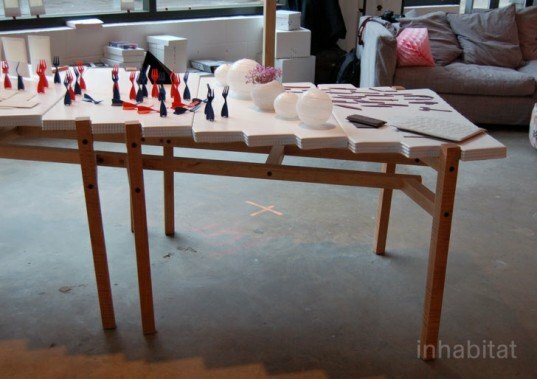 As part of New York Design Week, a group of galleries and shops in Manhattan's Noho area joined forces to create the second annual Noho Design District -- a design fair that runs parallel to the International Contemporary Furniture Fair. Exhibits and presentations ranged from The Future Perfect's massive popup shop/display on the Bowery to almost-undercover shows like Modern Craft, curated by Sight Unseen. See all our top picks from the shows, ahead! 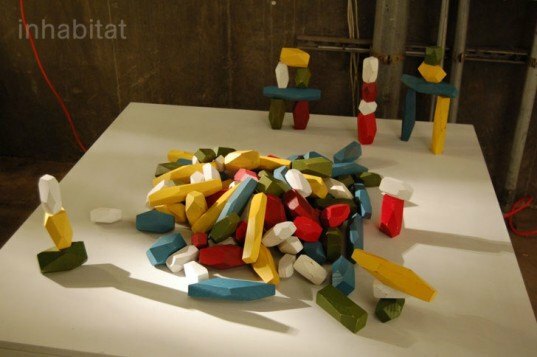 At a popup space at 22 Bond Street, Areaware showed off these balancing blocks for grownups by Fort Standard. They’re handmade from repurposed hardwood scrap from local furniture shops, and have a colorful non-toxic finish. Also at 22 Bond, as part of an exhibit of work by designers living and working in Berlin, studio Roomsafari showcased their clever Cane Lamp. Use it wherever a little light is needed and there’s something to hang it on. It’s powered by low-energy LEDs. 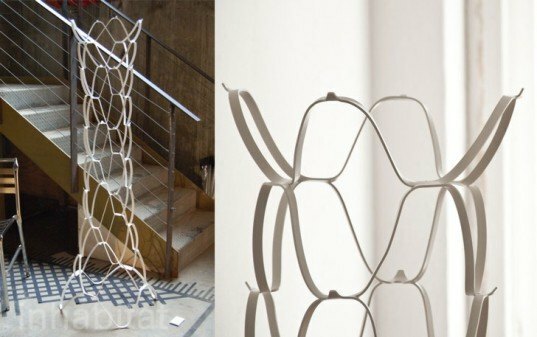 The Loll Tower, designed by Berlin-based E27 for manufacturer Pulpo, was another innovative piece at 22 Bond. The sturdy, elegant wardrobe/coat rack is made of a single sheet of expanded steel. 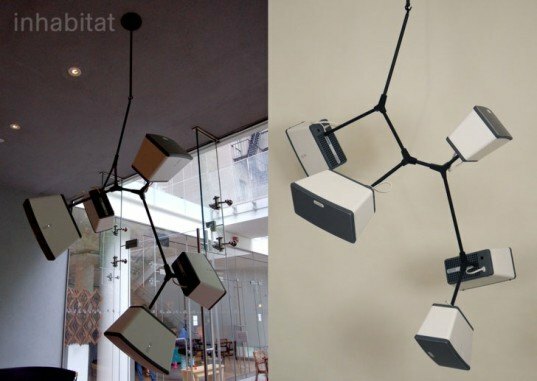 Audio equipment company Sonos sponsored a listening lounge at the Standard Hotel, where we found this one-off “Soundalier”–a hybrid ceiling sculpture/speaker by lighting designer Lindsay Adelman and product and jewelry designer Kiel Mead. 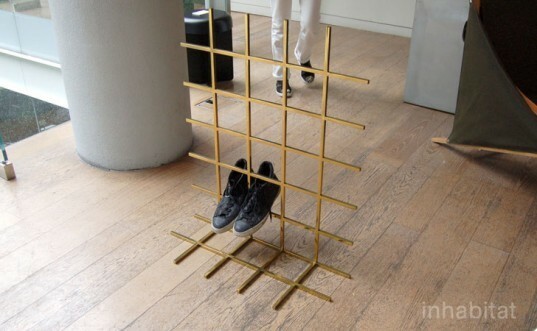 Also at the Standard was a show of California-based designers’ work that included a collection of simple, practical tube-metal valets in a few unexpected finishes by Steven Shein. This shiny brass design, the 3.1, is so simple, yet we’ve never seen one like it before. 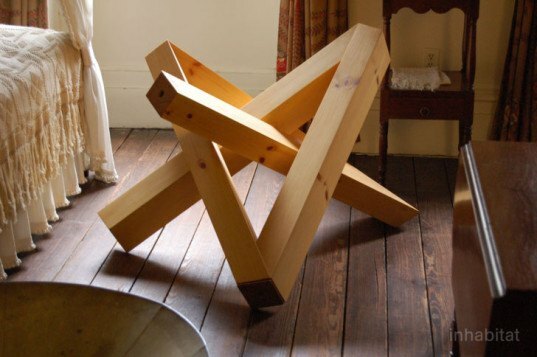 The Modern Craft exhibit, curated by Sight Unseen at the Merchant’s House Museum, exhibited numerous contemporary designs in an immaculate townhouse on East 4th Street that’s been kept exactly as it was originally built and furnished for an upper-middle-class merchant’s family in the 1830s. Each Modern Craft piece, made using traditional craft techniques, was inconspicuously mixed in with the period antiques of the house. Louis Lim‘s Star Knot was one of the standouts. At first it looks like simple sculpture, but further examination reveals that it’s a storage unit with arms of the star concealing long, narrow drawers. 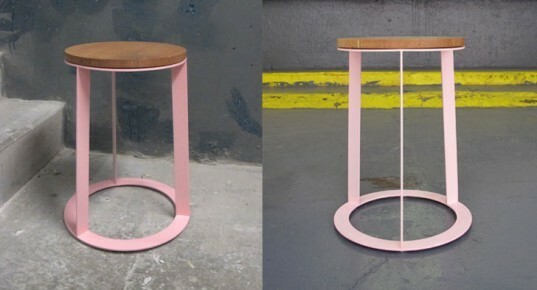 At Relative Space, also on Bond Street, furniture designer So Takahashi‘s displayed his Toro stool. It looks almost like it was drawn in yellow marker instead of stamped out of sheet metal. Lighting source Roll & Hill shared a huge, sunny popup space with The Future Perfect at 2 Cooper Square, and Jason Miller‘s Endless lights were among the standouts. Tubular light fixtures, available both straight and corner-bent, can be combined ad infinitum to make a lovely updated take on fluorescent factory tube lighting. Jonah Takagi‘s Bluff City (a.k.a. Memphis, Tennessee) pendant light was also part of Roll & Hill‘s collection at their 2 Cooper space. This fixture combines refined sensibilities and industrial work-lighting in creamy-delicious colors. Part of the Future Perfect‘s show at 2 Cooper was a traveling show called Whatnot, which featured pieces by product design students at the School of the Art Institute of Chicago. Among the standouts was this dining Table for 8 by Stephen Gulau, whose top is made of panels of sheet acrylic melted in a thermoformer onto a sheets of corrugated polycarbonate. BALANCING BLOCKS BY FORT STANDARD, FOR AREAWARE At a popup space at 22 Bond Street, Areaware showed off these balancing blocks for grownups by Fort Standard. They're handmade from repurposed hardwood scrap from local furniture shops, and have a finish. BALANCING BLOCKS BY FORT STANDARD, FOR AREAWARE At a popup space at 22 Bond Street, Areaware showed off these balancing blocks for grownups by Fort Standard. They're handmade from repurposed hardwood scrap from local furniture shops, and have a colorful non-toxic finish. 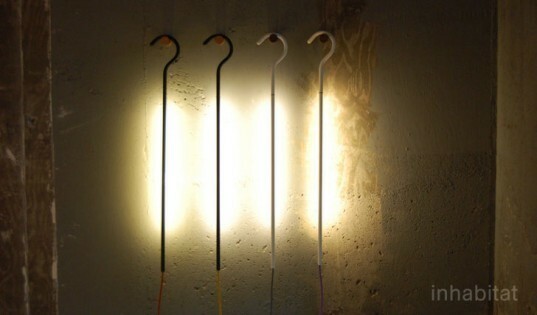 CANE LIGHTS, BY ROOMSAFARI Also at 22 Bond, as part of an exhibit of work by designers living and working in Berlin, studio Roomsafari showcased their clever Cane Lamp. Use it wherever a little light is needed and there's something to hang it on. It's powered by low-energy LEDs. LOLL TOWER, BY E27 The Loll Tower, designed by Berlin-based E27 for manufacturer Pulpo, was another innovative piece at 22 Bond. The sturdy, elegant wardrobe/coat rack is made of a single sheet of expanded steel. Audio equipment company Sonos sponsored a listening lounge at the East Village Standard Hotel, wher SONOS SOUNDALIER, BY LINDSAY ADELMAN Audio equipment company Sonos sponsored a listening lounge at the Standard Hotel, where we found this one-off "Soundalier"--a hybrid ceiling sculpture/speaker by lighting designer Lindsay Adelman and product and jewelry designer Kiel Mead.e we found this one-off "Soundalier"--a hybrid ceiling sculpture/speaker grouping by lighting designer Lindsay Adelman and product/jewelry designer Kiel Mead. VALET 3.1, BY STEVEN SHEIN Also at the Standard was a show of California-based designers' work that included a collection of simple, practical tube-metal valets in a few unexpected finishes by Steven Shein. This shiny brass design, the 3.1, is so simple, yet we've never seen one like it before. At Relative Space, also on Bond Street, furniture designer So Takahashi's graphic designer roots were showing in his Toro stool--it looks almost like it was drawn in yellow marker instead of stamped out of sheet metal. ENDLESS LIGHTS, BY JASON MILLER Lighting source Roll & Hill shared a huge, sunny popup space with The Future Perfect at 2 Cooper Square, and Jason Miller's Endless lights were among the standouts. 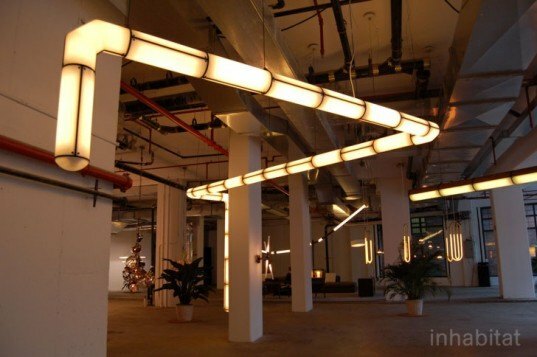 Tubular light fixtures, available both straight and corner-bent, can be combined ad infinitum to make a lovely updated take on fluorescent factory tube lighting. BLUFF CITY PENDANT LIGHT, BY JONAH TAKAGI Jonah Takagi's Bluff City (a.k.a. 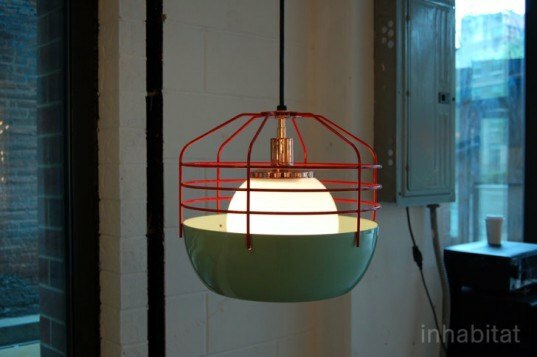 Memphis, Tennessee) pendant light was also part of Roll & Hill's collection at their 2 Cooper space. This fixture combines refined sensibilities and industrial work-lighting in creamy-delicious colors. TABLE FOR 8, BY STEPHEN GULAU Part of the Future Perfect's show at 2 Cooper was a traveling show called Whatnot, which featured pieces by product design students at the School of the Art Institute of Chicago. Among the standouts was this dining Table for 8 by Stephen Gulau, whose top is made of panels of sheet acrylic melted in a thermoformer onto a sheets of corrugated polycarbonate. Table for 8 by Stephen Gulau.